Dozens of government opponents have gone on trial across Cuba in what is being seen as the harshest crackdown on dissent in years. Hearings began in the cases against at least 78 dissidents accused of working to subvert Fidel Castro's government. The trials are taking place behind closed doors and supporters of the accused say some face life imprisonment. The government is releasing little information beyond saying the defendants are charged with plotting against Cuba with the top US representative in Havana, James Cason. Among the accused is Marta Beatriz Roque, a noted economist who led a hunger strike to demand the release of political prisoners. 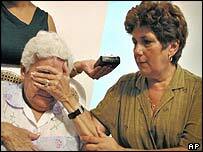 She was detained along with an independent journalist, Raul Rivero, who works outside Cuba's state-controlled media. One report said those arrested also included Hector Palacios, an organiser of reform efforts known as the Varela Project. During three weeks of mass arrests, Cuban officials said that those being held were counter-revolutionaries and mercenaries in the pay of the US Government. The arrests have been condemned by human rights groups. Some are accusing Cuba of attempting to stifle all internal opposition while the world is distracted by the war in Iraq. Raul Rivero's wife was quoted as saying of her husband: "He is only a man who writes, he is not a politician. "He knew they would come for him in this wave of repression." According to the Associated Press news agency, officials carried away plastic bags full of documents from Mr Rivero's home. The arrests followed a souring of relations between Washington and Havana, after Mr Cason's arrival as the new head of the US interest section in Cuba last September. 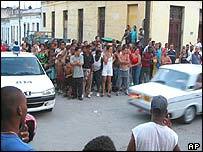 The BBC's correspondent in Havana, Stephen Gibbs, says Mr Cason is the focus of something approaching a personal vendetta by the Cuban Government. He adds that Mr Cason irritated President Castro by stepping up US support for his opponents, and regularly meeting opposition members and journalists in his Havana residence. The US state department has accused the Cuban Government of using "Stalinist tactics" against its opponents and said the trials were a sham. "The Castro regime's actions are the most despicable act of political repression in the Americas in a decade," it said in a statement. Cuba and the US have not had formal diplomatic relations for more than 40 years, but the US does have a limited presence in Havana.